Karuizawa Lake Garden is a natural garden that displays creative harmony between humans and nature. The garden opened again this year on April 20 and will stay open until November 4. Head there during Golden Week for the best time to see the garden’s popular tulips, and June 16 to July 1 to see the roses in full bloom. 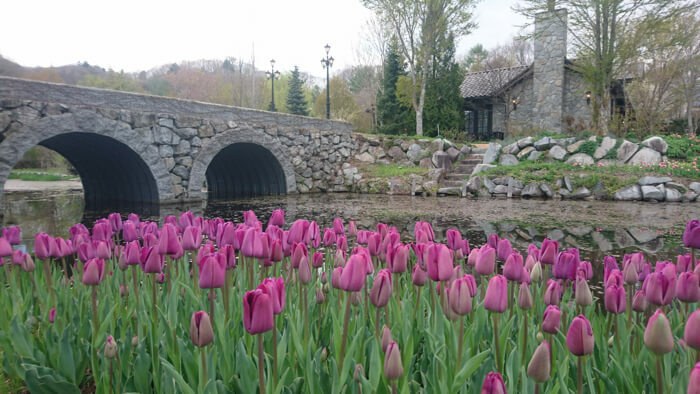 There are 8 areas to enjoy in this natural garden, each of which are decorated in the natural vegetation of Karuizawa through the four seasons, especially roses. Across the 10,000m2 area are close to 400 varieties of English roses, perennial plants, herbs and more. Most of the flowers there bloom along the garden’s waterfront. The tulips flower a little later in Karuizawa, from April and May. The resort town has cool weather characteristic of such a plateau, and it’s here where the flowering season will arrive later than Tokyo and elsewhere. Also, the roses are most beautiful from the middle of June to the start of July. Various events are planned for this year’s top rose season. The weeping cherry trees on the lake shore are also an absolute must-see springtime sight. If you’re in Japan, then definitely visit Karuizawa Lake Garden during the flowering season. *Opening times may differ depending on the season so please check the homepage for details. *The garden will be closed one hour earlier every Wednesday of maintenance.